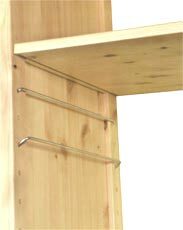 SHELFSTORE’s pine shelves including corner shelving units, bookcases, CD and DVD shelving provide an infinite array of permutations and combinations help you to make the most of your living space. Our shelving units combine practical storage with a modern style. Why not let us help you to realise the ideal home organisation solution for you. SHELFSTORE’s domestic shelving and bookcases unit provide a unique and distinctive touch to any room, by combining versatility and practical space saving solutions with a modern and attractive design.